Situated on the banks of the River Tay is the historical little town of Dunkeld. With its ancient Cathedral, and the wonderful nature of the Hermitage, Dunkeld is a perfect holiday destination for young and old. Close to the A9 between Perth and Pitlochry, Dunkeld offers more than just the quick bite to eat or hotel bed for the wary traveller. The Pend, Hilton Dunkeld and Atholl Arms Hotel all offer stunning scenery and great leisure activities like golf, river canyoning and white water rafting for your next visit to Perthshire. Situated in the heart of Perthshire, The Angus Hotel is Blairgowrie’s premier leisure hotel. The Angus Hotel is family owned and offers an exceptional combination of professional service and comfort to all guests. The hotel also boasts a modern, fully equipped leisure club and indoor pool as well as a Ballroom which comes alive at night with live ceilidhs and cabaret shows. Known as one of Perthshire’s best known hotels for the past 100 years, The Angus is the perfect base for exploring the surrounding area and experiencing some warm Scottish hospitality at its best. Whether you want to try your hand at golf at the nearby Rosemount Golf Course or take a trip to a local distillery to sample a true Scottish whisky it is all located on the doorstep of this popular hotel. With Highland Perthshire within a short drive there are many unspoilt roads and routes for the explorer in you to enjoy. Steeped in history are the Highland towns of Dunkeld and Pitlochry which are within a 45 minute drive where you can visit local attractions including The Hermitage, Blair Castle, Atholl Palace and Pitlochry Theatre. During the colder months The Angus Hotel is a popular base for winter sports enthusiastic, with the ski slopes of Glenshee being 30 minutes away. Whatever the reason for your visit, The Angus Hotel is an ideal place to experience some true Scottish hospitality in an excellent location. Welcome to the Birnam Hotel, where style, elegance and good old-fashioned Scottish hospitality is what it's all about. Located in the stunning Perthshire countryside in the heart of Scotland, the Birnam Hotel is the ideal location from which to explore the stunning Perthshire countryside. 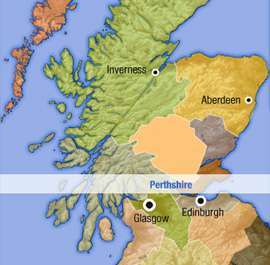 The hotel is only 15 miles north of Perth on the A9 (Perth - Inverness road). This Baronial Style hotel stands on the south bank of the River Tay, Scotland's premier salmon fishing river. Close to the hotel stands the Birnam Oak, the last remnant of Birnam Wood made famous in Shakespeare's Macbeth. Each of the 25 bedrooms have been decorated to complement the hotel's unique style. All rooms are individually and tastefully decorated and care has been taken to compliment the hotel's unique style. The rooms have en-suite facilities with WiFi access, colour satellite TV, direct dial telephone, hairdryer and welcome hospitality tray. ***IMPORTANT: We only have two rooms allocated for guests who wish to bring their dog, this must be pre- booked - £10 per night charge, pay directly to the hotel. Single occupancy room bookings which require a double bed, there will be a charge supplement of £5 payable directly to the hotel. Enjoy a delicious meal from a superb selection of the finest Scottish and international cuisine. The Scots Bar has been decorated in the style of Rennie Mackintosh providing that unique atmosphere for which the Milton Birnam Hotel is renowned. The walls of the bar pay homage to Scottish Heroes - a real talking point while you relax with a drink or a delicious light meal. As you would expect, the bar has a wide range of malt whiskies, traditional ales, spirits, beers and soft drinks, not to mention superb bar meals on offer seven days a week. Our hotel is well renowned for hosting weddings and large functions in the magnificent Baronial Hall and smaller functions in its many other suites which now includes Beauty by Lennox, our beauty salon offering a wide range of Guinot treatments from manicures to facials, with our fully trained beautician - the Birnam Hotel has it all. 15 miles north of Perth on the A9 (Perth - Inverness road) From Perth direction take the turning signposted BIrnam/Dunkeld, follow the main road through the village. The hotel is situated in centre of the village on the right hand side. From Inverness direction take the turning signposted Dunkeld, then take the first turning to the right and carry along the main road to the centre of the village the hotel is situated on the left hand side. A warm and relaxing atmosphere awaits you at Ivybank Lodge, a magnificent Victorian house, built around 1850 and set within an acre of mature gardens. We are located just a couple of minutes walk from the centre of Blairgowrie, a picturesque market town in the heart of beautiful Perthshire. The area offers easy access to championship golf courses, excellent salmon rivers, and some of Scotland’s finest skiing and snowboarding resorts. The city of Perth is 16 miles away, whilst Dundee (19 miles), Pitlochry (24 miles), Glenshee (24 miles), St. Andrews (32 miles), Edinburgh (59 miles), Glasgow (74 miles) are all within easy reach. The nearest international airport is Edinburgh (57 miles). There is a comfortable lounge available for guest use. Wi-Fi available throughout the house. Secure storage for bicycles and motorcycles. We look forward to making your stay in Scotland truly memorable! Nearest city - Perth (16 miles). By car, take the A93 signposted Blairgowrie, Ivybank Lodge is on the right just after crossing the River Ericht. Nearest airport - Edinburgh International (57 miles). By car, take the A90/M90 to Perth then A93 signposted Blairgowrie. Ivybank Lodge is on the right just after crossing the River Ericht. By bus - the bus station at Blairgowrie is just a few minutes walk from Ivybank Lodge. By train - nearest railway station is Perth. Perth bus station, from where there are regular services to Blairgowrie, is situated next to the railway station. Discover a highland escape at Dunkeld House Hotel with. Once the summer residence of the Dukes of Atholl, the hotel is idyllically set on the banks of the River Tay in the heart of Perthshire's Big Tree Country. Dunkeld House offers all guests FREE WiFi and FREE Parking. Located in the charming town of Dunkeld, just an hour's drive from Scotland's main cities of Edinburgh and Glasgow this country house hotel combines scenic seclusion with excellent proximity to local attractions. Set on a 280-acre woodland estate, Dunkeld House Hotel is home to the Dunkeld Activity Park offering outdoor activities including falconry, fishing, quad biking, archery, and clay-pigeon shooting. Play 9-holes on the hotel's putting course or challenge family and friends to a game of tennis. Treat yourself to a massage at the spa, work out at the fitness centre, or enjoy a swim in the heated indoor pool with whirlpool, sauna, and steam facilities. Sample Scottish specialty dishes prepared using the freshest local ingredients at the Garden Restaurant overlooking the River Tay and enjoy a single-malt in the Garden Bar. Relax in the cozy atmosphere of the River Lounge with a light lunch or aromatic coffee. Hold weddings and celebrations for up to 200 guests choosing from a riverside ceremony, indoor event or the marquee in the grounds, and rely on the expert team to help plan every detail. Host meetings and team building events, taking advantage of the expansive indoor events space and variety of outdoor activities on offer at Dunkeld House.